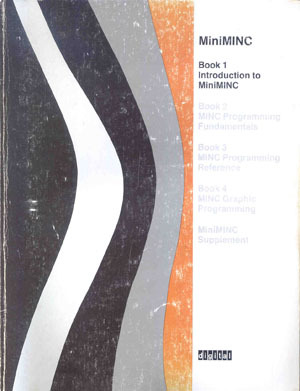 The MiniMINC is a preparation and analysis only version of the Minc-11. The MINC-11, or Modular-INstrument Computer is a PDP-11-03 variant with a configurable measurement rack. 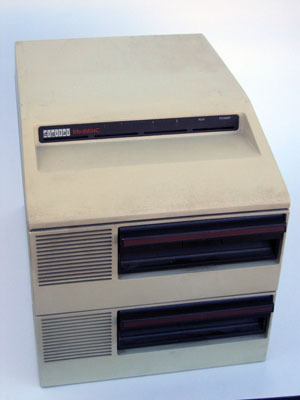 A complete MiniMINC system consisted of a renamed PDT-11/150, a VT105 terminal and the MiniMINC OS and documentation. 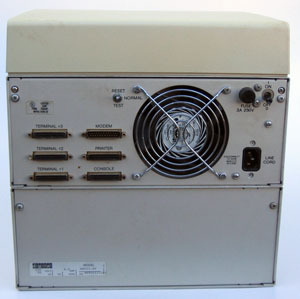 The PDT-11/110 and PDT/130 were 'smart-terminals' as they were housed in a VT-100 enclosure. Front The DEC MiniMINC is a compact budget version of the PDP-11. The original Minc-11 is a PDP-11 with rack for measurement interfaces. The MiniMINC is only the CPU part with two 8" floppy drives. The only interfacing are the serial ports ar the back. The front has no controls, only four LEDs indicating CPU status. Originally the MiniMINC consists of the chassis shown here and a Dec VT-105 terminal, a VT-100 like terminal with graphic capabilities. The MiniMINC was targeted for the analysis of data. As the MODEM and TERMINAL ports are not supported by MiniMINC Basic, there is no simple way to collect data with the MiniMINC other than via floppy disks. The BASIC contains functions to perform FFTs on data and could convert an array directly to graphic commands for the VT-105. I have a VT-125, but did not manage to get it in the proper VT-105 emulation mode. Back At the back are six serial ports, five female, one male. One swich has three modes: normal (middle), reset (up, momentary) and test (down). On this machine the swich is not original. The serial ports are labelled TERMINAL #3 to TERMINAL #1 (left) and MODEM, PRINTER and CONSOLE (right). The CONSOLE is where to connect the VT105 terminal or PC with terminal software. For non-graphics usage a VT100 will also do. The baud rate is autodetected by the '@@' sequence. The maximum baud rate is 9600 for CONSOLE and PRINTER, 2400 for the TERMINALs #1 to #3. For both VT105 terminal and PC with terminal software use a cable connecting at least pin 1, 2, 3, 7 and 20. Without the Terminal Ready handshake line at pin 20 it is possible to start the boot sequence but still getting no reply from the MiniMINC. The MINIMINC Basic does not support the MODEM and TERMINAL ports, the only devices are SY0: and SY1: for the floppy drives and LP: for the PRINTER port. sandwich Under the top cover are four boards, sandwiched together. 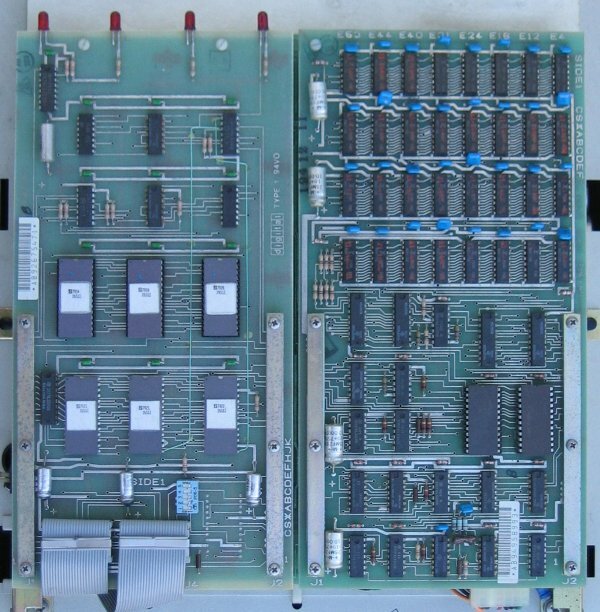 At the top are two boards, RAM (left) and serial IO (right). The middle board is the CPU. 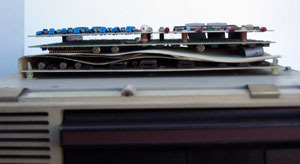 A paper/metal/paper shield separates the CPU board from the floppy controller board at the bottom. DLT11 The RAM chip type is Fujitsu MB8116 (16k x 1), So total RAM is 64 kByte, or more likely 32 kWord. The flatcables at the lower left lead to the serial port boards. The UARTS are Signetics 2651. The LEDs (top left) are the front panel indicators. 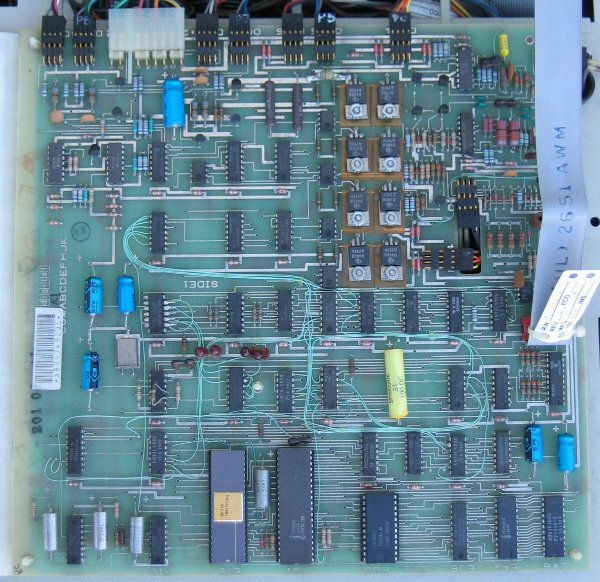 KDT11 > The PDP-11 CPU are the chips at the left. At the right is a 8085 processor, probably for IO. The flatcable close to it lead to the Disk Controller module. RXT11 The floppy controller board is actually all floppy drive electronics for two drives integrated with a normal floppy controller (FDC 1771 at the bottom). All small black connectors lead directly to heads, sensors and motors on the drives. The transistors in the middle are drivers for the head stepper motors. Next to the floppy controller chip is a 8085 processor, a ROM and some RAM. I assume this board, with the two disk drive mechanisms are the equivalent of a set of RX01's. Three blank but pre-initialized floppies. Very useful as the MINIMINC/BASIC disks are master disks and can only be used for the creation of working disks. At least V1.1 (1979) and V1.2 (1980) were released. The system disk boots directly into BASIC, so no OS operations are needed. Note that the RX01 firmware in the MiniMINC cannot use nonformatted disks. 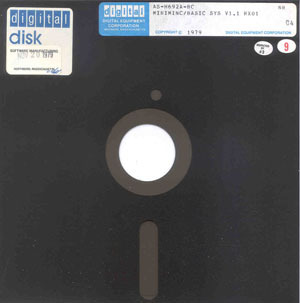 The disk has to be initialized with 128 byte sectors. For MiniMINC Basic (and RT-11) formatting is just creating a directory structure. Single sided, Single density, 77 tracks. 26 sectors of 128 bytes, interleave 1. See the floppyImages directory for backupped disk images. At power up and reset: 1, 2 and Power light up. 1 goes out immediately. During booting and normal operation Run and Power light up. Normal operation is the middle position "NORMAL". The momentary up position "RESET" is obviously for resetting the MiniMINC. The lower position "TEST" is for test purposes. The manual warns that it can erase disk contents. "Type start unit number (0 or 1):". 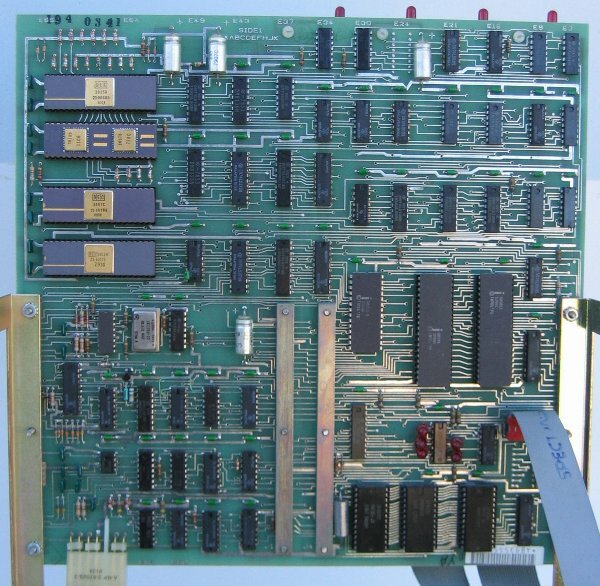 The MiniMINC is however a proper PDP-11 with a LSI "F-11" processor. Removing one or both of the boot-ROMs at top RAM/ROM board has it fall back to the ODT prompt.